.300 Weatherby 178 grain Hornady ELD-X~ Roy Weatherby already had experience with other custom cartridges such as his own .270 Weatherby Magnum when he created the .300 Weatherby. Like most of his other magnum cartridges, this is based on a blown-out .300 H&H Magnum case, using the signature Weatherby double-radius shoulder. It is often debated which came first the 300 Winchester Magnum or the 300 Weatherby Magnum, the Weatherby was first 1944 vs the Winchester was introduced in 1963. With the .300 Remington Ultra Magnum being introduced in 1999. Historically, Weatherby claimed that this is the most powerful .30 caliber magnum rifle commercially available, but the recently introduced .300 RUM and Weatherby’s own .30-378 Weatherby Magnum are now more powerful. One could say, the .300 Weatherby was 50 years ahead of its time as it has only been recently that suitable optics and range finders for long range hunting have been available to the public at affordable prices. 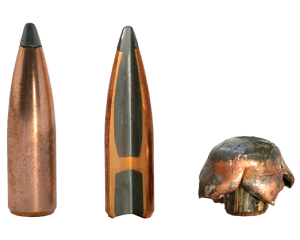 The .300 Wby is in common use by big-game hunters all over the world. 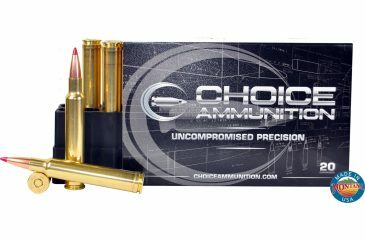 Choice Ammunition has taken our 100% hand-loading techniques and produce an extremely accurate, highly dependable round for the .300 Weatherby in this load. Our loading tolerances are only matched by passionate hand-loaders in their own loading rooms. Consistent seating depths, powder charges and proprietary formulas of Choice Ammunition, make this 178 grain Hornady ELD-X round the best you can buy on the commercial market today. .300 Weatherby 180 grain Barnes Tipped Triple Shock (TTSX)~ Roy Weatherby already had experience with other custom cartridges such as his own .270 Weatherby Magnum when he created the .300 Weatherby. Like most of his other magnum cartridges, this is based on a blown-out .300 H&H Magnum case, using the signature Weatherby double-radius shoulder. Choice Ammunition has taken our 100% hand-loading techniques and produce an extremely accurate, highly dependable round for the .300 Weatherby in this load. Our loading tolerances are only matched by passionate hand-loaders in their own loading rooms. Consistent seating depths, powder charges and proprietary formulas of Choice Ammunition, make this 180 grain Barnes TTSX round the best you can buy on the commercial market today. The Tipped Triple-Shock bullet delivers the same “three strikes you’re out” rule. Once as it strikes game, two as the bullet begins to open and a third impact when the cavity fully expands to deliver extra shock with maximum transferred energy. 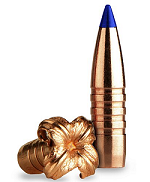 The added polymer tip creates a faster expansion rate as well as better long range ballistics. Ideal for deer-sized game. 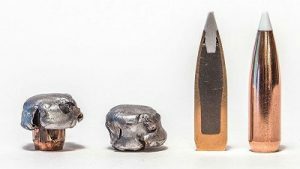 .300 Weatherby 180 Grain Nosler AccuBond~ Roy Weatherby already had experience with other custom cartridges such as his own .270 Weatherby Magnum when he created the .300 Weatherby. Like most of his other magnum cartridges, this is based on a blown-out .300 H&H Magnum case, using the signature Weatherby double-radius shoulder. Choice Ammunition has taken our 100% hand-loading techniques and produce an extremely accurate, highly dependable round for the .300 Weatherby in this load. Our loading tolerances are only matched by passionate hand-loaders in their own loading rooms. Consistent seating depths, powder charges and proprietary formulas of Choice Ammunition, make this 180 grain Nosler AccuBond round the best you can buy on the commercial market today. .300 Weatherby 180 Grain Nosler Partition~ Roy Weatherby already had experience with other custom cartridges such as his own .270 Weatherby Magnum when he created the .300 Weatherby. Like most of his other magnum cartridges, this is based on a blown-out .300 H&H Magnum case, using the signature Weatherby double-radius shoulder. 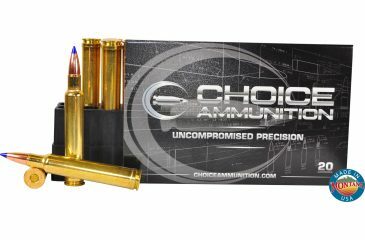 Choice Ammunition has taken our 100% hand-loading techniques and produce an extremely accurate, highly dependable round for the .300 Weatherby in this load. Our loading tolerances are only matched by passionate hand-loaders in their own loading rooms. Consistent seating depths, powder charges and proprietary formulas of Choice Ammunition, make this 180 grain Nosler Partition round the best you can buy on the commercial market today. .300 Weatherby Magnum 185 grain Berger VLD-Hunting~ Roy Weatherby already had experience with other custom cartridges such as his own .270 Weatherby Magnum when he created the .300 Weatherby. Like most of his other magnum cartridges, this is based on a blown-out .300 H&H Magnum case, using the signature Weatherby double-radius shoulder. 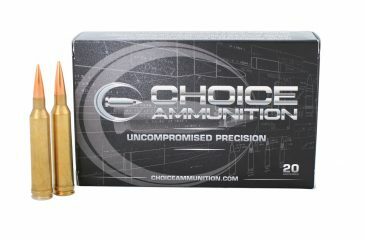 Choice Ammunition has taken our 100% hand-loading techniques and produce an extremely accurate, highly dependable round for the .300 Weatherby in this load. Our loading tolerances are only matched by passionate hand-loaders in their own loading rooms. Consistent seating depths, powder charges and proprietary formulas of Choice Ammunition, make this 185 grain Berger VLD-H round the best you can buy on the commercial market today. .300 Weatherby 200 Grain Nosler AccuBond~ Roy Weatherby already had experience with other custom cartridges such as his own .270 Weatherby Magnum when he created the .300 Weatherby. Like most of his other magnum cartridges, this is based on a blown-out .300 H&H Magnum case, using the signature Weatherby double-radius shoulder. Choice Ammunition has taken our 100% hand-loading techniques and produce an extremely accurate, highly dependable round for the .300 Weatherby in this load. Our loading tolerances are only matched by passionate hand-loaders in their own loading rooms. Consistent seating depths, powder charges and proprietary formulas of Choice Ammunition, make this 200 grain Nosler AccuBond round the best you can buy on the commercial market today. .300 Weatherby Magnum 212 grain Hornady ELD-X~ Roy Weatherby already had experience with other custom cartridges such as his own .270 Weatherby Magnum when he created the .300 Weatherby. Like most of his other magnum cartridges, this is based on a blown-out .300 H&H Magnum case, using the signature Weatherby double-radius shoulder. 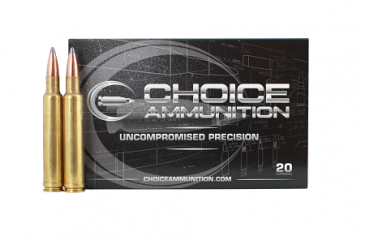 Choice Ammunition has taken our 100% hand-loading techniques and produce an extremely accurate, highly dependable round for the .300 Weatherby in this load. Our loading tolerances are only matched by passionate hand-loaders in their own loading rooms. 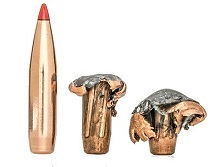 Consistent seating depths, powder charges and proprietary formulas of Choice Ammunition, make this 212 grain Hornady ELD-X round the best you can buy on the commercial market today. 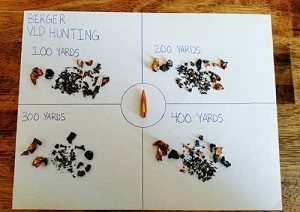 .300 Weatherby Magnum 210 grain Berger VLD-Hunting~ Roy Weatherby already had experience with other custom cartridges such as his own .270 Weatherby Magnum when he created the .300 Weatherby. Like most of his other magnum cartridges, this is based on a blown-out .300 H&H Magnum case, using the signature Weatherby double-radius shoulder. Choice Ammunition has taken our 100% hand-loading techniques and produce an extremely accurate, highly dependable round for the .300 Weatherby in this load. Our loading tolerances are only matched by passionate hand-loaders in their own loading rooms. Consistent seating depths, powder charges and proprietary formulas of Choice Ammunition, make this 210 grain Berger VLD-H round the best you can buy on the commercial market today.